The petition has been delivered. Hundreds of commuters to the University of Maryland agreed to Just Say No To Parking Fees. This morning we have delivered the Just Say No To Parking Fees petition to the target, Linda Clement, Vice President of Student Affairs. Where are the commuters ? 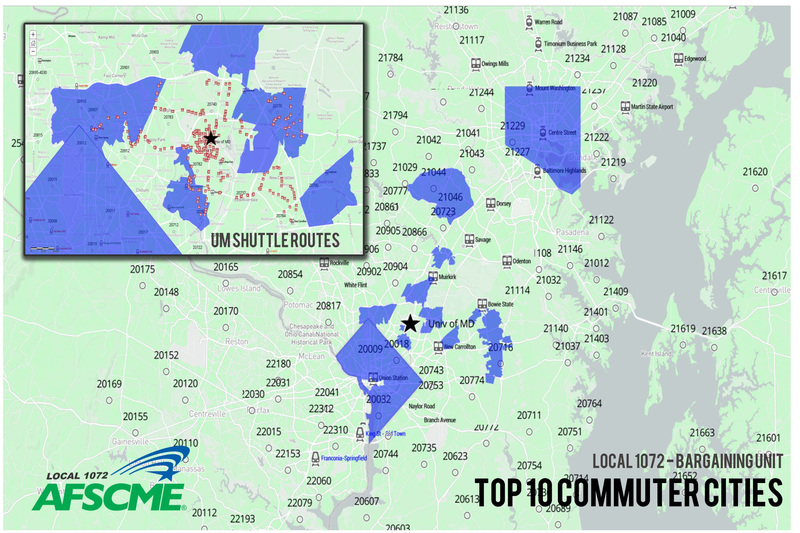 Using the locations of staff commuting to College Park, Maryland, we were able to draw an area map of Top 10 Commuter Cities. Below is the map zoomed out. Each zip code on the map is where a staff member starts their commute. Much of our staff are commuting from areas where there's not many options for transportation to the University of Maryland. Today, your Bargaining Action Team will be meeting with campus administration to voice the concerns of our community at contract negotiations. Students are also joining the fight as the Department of Transportation is moving to increase their student fees or reduce shuttle services. With so much at stake, now is not the time to celebrate. You can do more by continuing to share the petition with other commuters as the next target will be David Allen, Executive Director, Department of Transportation. We will continue to work with the community to raise awareness about the needs of commuters and the price gouging of our most vulnerable community members. AFSCME Maryland is inviting you to bring your family and friends for a day of fun and an opportunity to meet other members, union stewards, and politicians who support state employees. Let's give a good ole fashion "Union Clap" to the University of Maryland, 2017 Employee Contract Bargaining Team. We represent exempt & nonexempt employees from multiple departments on campus. Here is the roster for this year's team (in no particular order).